See the February 26, 2012 addendum to this page at the bottom of the post. The other day I was asked to make a travel journal for a painter who wanted to work on Fabriano Artistico 140 lb. 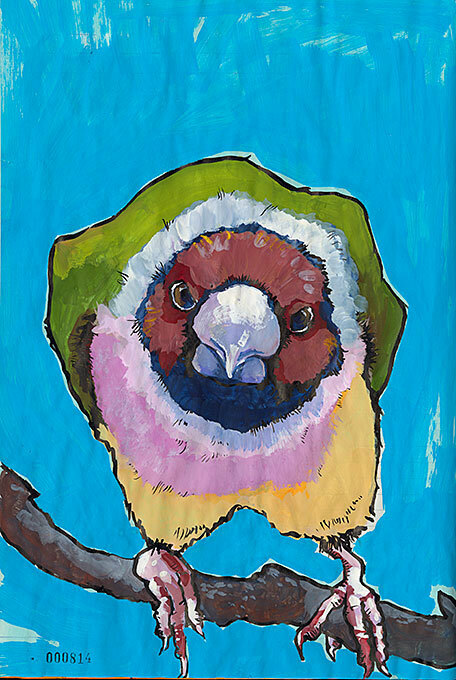 watercolor paper with a cold press surface. I routinely make journals using this paper brand and weight, but not with this surface; I prefer hot press. I was surprised then when I brought the paper home and started tearing it down that it didn’t seem right. First, I knew from past use that Fabriano Artistico 140 lb. hot press (which is what I normally use) has the grain running parallel to the 30 inch width of the paper (or with the deckle). Since I was making a square book I had already marked and torn off a strip at the base of the 30 inch width. It didn’t tear as if it were tearing with the grain. 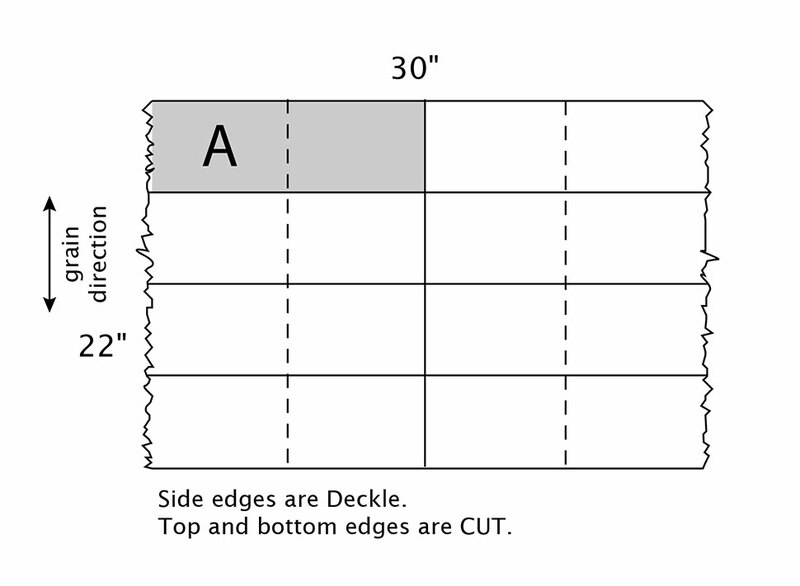 Additionally there were two cut edges on the sheet. My other Fabriano Artistico always had two deckle edges and two TORN edges. Folding the paper in preparation to tear it also didn’t seem right; it wasn’t folding easily as it should when folding with the grain. Then I realized that the deckle edges weren’t where they normally were. I realized that this cold press sheet wasn’t like the hot press sheets I normally work with. It was obvious by gently bending the sheet in half first vertically and then horizontally (without folding or creasing the sheet) that the grain direction of the cold press paper was now running parallel to the 22 inch dimension of the paper. This meant that if I continued to tear paper as planned the fold in my signatures would be against the grain, something you don’t want in bookbinding for a host of reasons. Happily, the book that I was tearing down was to be squarish in format. The fact that I had already torn off the “waste” strip now limited the maximum height of my textblock, but I could still get 4 pieces out of the sheet as planned and still roughly the same size. This week after getting the different 140 lb. paper, I called my local paper store to ask if there had been any changes to the Fabriano line. The paper buyer confirmed that they had been told there would be a change in the cutting of the paper, she just didn’t realize they already had new stock. I’m writing about this today because over the years my students and I have been happily tearing the paper down using information based on diagram A. This has been correct. It is no longer correct however. Also, the store did not know whether this was going to be an across the board change in all the surfaces and weights, or just the Cold Press, 140 lb. We’re waiting for more information on that. I wanted my students and visitors to my website (who ask me questions) to know about this change so that they can take it into account when planning their next book with this paper. I also wanted to write about it because I’m a bit worried. When a paper changes in manufacturing other things often happen to the paper. The last time something like this happened to me was with Folio paper. Friends and students know the whole story but the brief account is that before 2000 I could get a fabulous paper called Folio, and after 2001 I could get an OK paper called Folio (still available today and a serviceable paper but not the same thing by any stretch of the imagination). * I learned that the paper was being made by a different mill for the parent company. * Note: I am judging Folio based on my needs as a visual artist working in journal form. Folio is a printmaking paper and the current incarnation of Folio may meet or exceed any needs of a printmaker using it. I’m training myself to think of the current Folio as having nothing to do with its predecessor. That way I can learn to love and appreciate it for its quirks and uses, and not always compare it to what was the perfect paper for art journals. I hope this isn’t the beginning of the end of this wonderful paper. I did use some of the cold press paper from this batch. Since I’m not a regular user of 140 lb. cold press I can’t say if it is the same or not; it worked in a lovely fashion and I know the person working in the journal I made with it it will have success working on this paper. For some of you this change won’t matter at all, either because you don’t make books so you’re only concerned with painting on the paper and not the grain direction (and you find the paper works the same for you), or it doesn’t matter to you because you have lots of alternative papers you enjoy binding into books. I’m not an advocate of the “perfect paper.” It’s a no-win game. When you find a great paper and go to get more of it you often find the mill has closed or some corporation has taken over and fired the artisans and is now making a “ghost” of the former paper. If, however, Fabriano Artistico 140 lb. 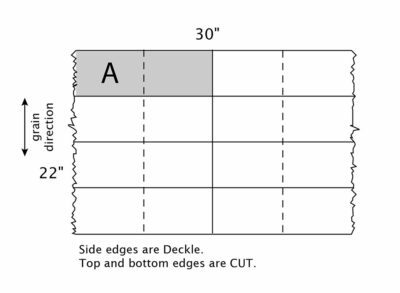 cold press is a paper you use for binding (or painting) consider this a heads up that there are changes. 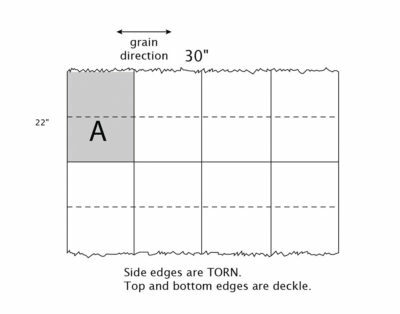 And if you are binding ANY of the weights and textures of this paper, make a determination of grain direction before you start tearing down pages for your book. Just another point, in passing. It is sad not to have the two TORN edges on the sheet. Since I tear paper down to make books, rather than cut it, I create torn edges. Having a parent sheet that had deckle edges and torn edges when it came to me, meant I was adding more torn edges. That made for a very elegant book. The cut edges just aren’t as attractive, though I can live with them if that is all that changes. I hope this is not the beginning of something larger, starting at a corporate level and changing product to match some bottom line projections rather than creating product to fulfill an artist’s need. I’ve seen a lot of art materials go this way. We still don’t have an answer to our questions from that company. And it seems they don’t think it’s important that we get one. We only use their product. As for Fabriano Artistico, I don’t care if they have been in business for 400 years (or whatever it is). All bets are off, always check your grain direction. Note: People reading this page might also be interested in reading a later post of mine: Adventures in Bookbinding: Matching Paper Surfaces across a Spread. If you would like to know more about how I fold and tear paper please see “Project Friday: Tearing Paper To Make Signatures for a Handbound Journal“. It includes a video demonstration. In “More on Tearing Paper for Bookbinding,” I look at ways to move beyond a simple fold-and-tear of an entire sheet. By removing “waste” strips you can customize the size of your pages.